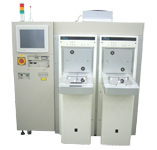 Comment ( SL473 ) | Product Information | TOWA LASERFRONT CORP.
Laser marking system for semiconductor wafers. Marking product names, lot numbers, control numbers, etc. on the front or reverse-side（※1) of wafer surface.